Full name not firmly established in Street Fighter; from India. Height: 6'0", Weight: 148 lbs. See this page for Dhalsim's depiction in the Street Fighter games, animation, and live action. Accessories: two purple knives (93 Zartan's), purple machete (88 Spearhead's), purple sword (93 Zartan's), purple bow (88 Storm Shadow's), purple sickle (92 Dojo's), purple figure stand (common). Over the course of his life, Dhalsim has sought to unify his mind, body, and soul through the discipline of Yoga. Now, as he nears his goal, Dhalsim must test himself and his skills before he can rise to a higher state of consciousness. By controlling his mind and body, Dhalsim is able to extend his arms and legs great distances. 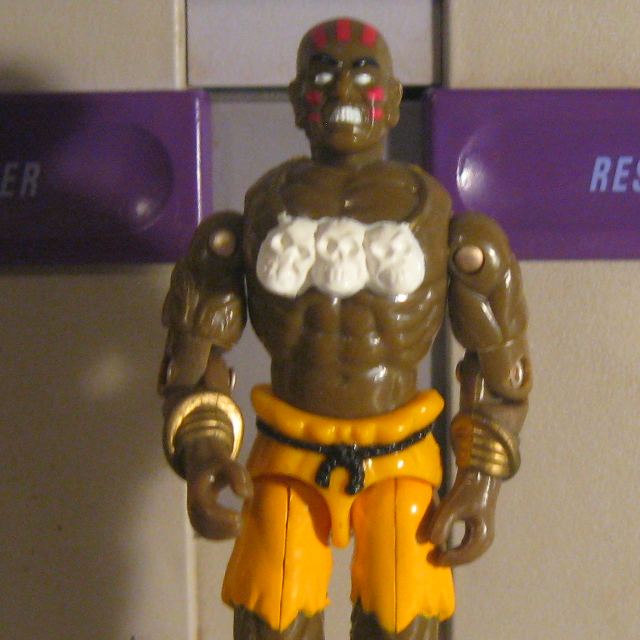 However, Dhalsim's greatest skill is his patience. He knows that he does not stand a chance in a slugging match. Instead, he concentrates on using his unique abilities to keep his enemies at a distance and to slowly wear them down. While Dhalsim will do everything he can to win, he will never hurt his opponent more than necessary. Motto: "I will meditate then destroy you." Toy Notes: Featured in the Street Fighter commercial, with emphasis on the second syllable ("seem"). Dhalsim shares Slice's action move. Item #81092.